Posted on January 11, 2017	by Timothy S.
It is the mid-1960s the setting and the scene are both borrowed from the film a Bronx Tale. The young 17 year old impressionable boy just started driving and is being mentored by a local mob boss whom carries a tremendous amount of respect in the all Italian neighborhood. Sonny the mobster teaches the teenager a lesson whom was dating a girl from another race. Back then that was as controversial as if Snoopy was hanging out with Felix the Cat. 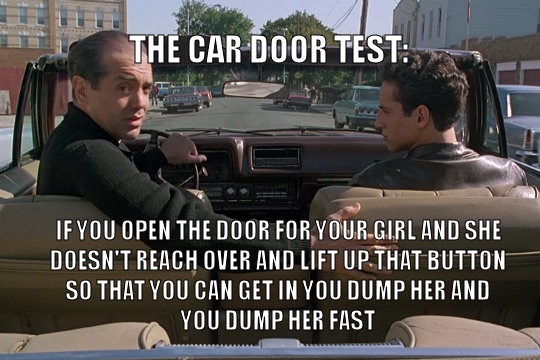 In a New York City accent, Sonny says (paraphrased), after you open the car door for her and you go to put the keys in to unlock your door, if she reaches over and unlocks your door for you, she’s a good woman and worth keeping. If she does not open the door for you, get rid of her and run the other way. I adopt this lesson to modern times for it is rare to find a car these days containing manual locks. Adaptively applying the same lesson in similar fashion, I ask the woman what her favorite Bible verse is; and after her response, if she asks me mine, she’s a potential keeper, if she does not ask me mine, that is not a good sign. She is probably self-absorbed. If it is a mindless moment for her and she does not ask me my favorite verse, and yet I have an interest in her, I may have to rent a car with manual locks and see if she leans over to unlock my door. I write this story with tongue-in-cheek yet with a subtle amount of seriousness. At the root of a good relationship, I believe it needs to be paved with strong and similar values and valuing the other person is key. If any possible future relationship of mine stumbles across this blog and reads this story, you are given a heads-up, lol. The moment is magical in the movie when the teenage girl reaches over to open the lock for the protagonist in the tale, of course the moment is shown in slow-motion as the boy gets an extra skip in his step riddled with excitement and a high-five type of smile and shouts yes! Posted on January 1, 2017	by Timothy S.
In awe my jaw drops serendipitously as my Pastor opens today’s message by stating, “Lately, I keep seeing the number 133.” This prompting leads Pastor Nick to teach about Psalm 133 from the Old Testament of God’s written Word. I nearly fall off my chair. 133 is a number that is near and dear to my heart in a way that no words can describe but I will attempt such measure in a future writing when the time is right. I have only shared this “magic” number with a handful of people for it is too personal to write about publicly, but today I am compelled to share what I will call my lucky number (133) for simplicity sake. As Pastor Nick says 133, I instinctively shout out from the last row in church. “That’s my number,” and he responds, Tim knows what I mean with numbers representing things. I do know what he means. I totally get it. God speaks to us in a way that we get it. He speaks our language and He speaks to our heart. He speaks to us in a language we will understand. Sometimes it is a puzzle and a mystery. It makes for great conversation. Sometimes God whispers in our ear and sometimes He has to knock a more dense person over the head with a message such as myself. It’s all good, I will take it anyway He gives it. Allow me to ask you, does God speak to you in numbers? Care to share? Post a comment or email me. For me, 133 is the form of a modern day angel. May God release His angels and messages whole-heartedly upon you. Just ask Him, see what happens and keep your ears and eyes open. I love you. Posted on December 15, 2016	by Timothy S. Brinjoy?? You may ask what the heck is that? Is there such a word? I think not, it is a cheap rip-off of the word enjoy which is derived strategically from the word joy. I fabricated the word in Jersey City style where the letter g gets dropped sometimes from the end of the word; for example, as said with an accent, bringin instead of the proper word bringing. Allow me to encourage you by inviting you to bring joy (brinjoy) to someone whether it be the next person you see in the street, at work, or at a mall as people shuffle briskly during the madness of this season; some completely stressed out just wanting to get home. You can brinjoy fast and for free simply by flashing a peaceful and happy smile. You can also brinjoy via a text, or a phone call to a long lost friend or distant family member. Make the lost art of a phone call and simply let them know you are thinking of them. How about the gift of an inexpensive poinsettia? I recently brought a fire-engine red poinsettia to an elderly lady whom I met briefly only one time, it completely brightened her day and the thought of bringing her an unexpected gift brought her joy. She could not believe the seasonal plant was for her. The joy on her face was as if a squirrel found a pound of already shelled acorns at the bottom of a tree within a few feet of its nest. I enjoyed this act of brinjoy before I even gave it a name. I enjoyed her delighted reaction. Now that I gave it a label, I will make it a point to brinjoy at least once a day. Brinjoy. I’d love to see it appear in the Webster Dictionary as a new and useful word. Again, the next place you go…..brinjoy. You will be happy you did. Through the Mist and Forever! 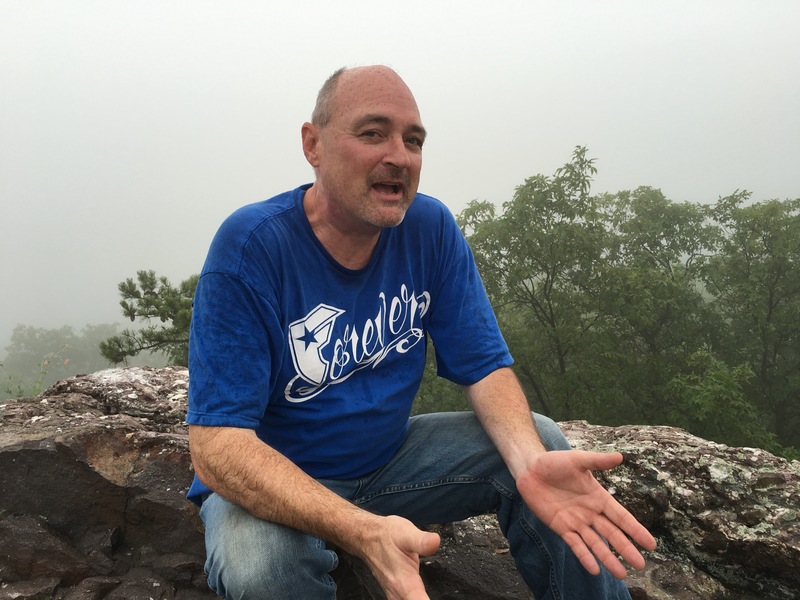 Posted on July 15, 2016	by Timothy S.
Humidity registers at 100 percent on a New York State mountain on the dawn after thunder-storms broke the late night sky. Stickier than freshly-coated honey buns, we march through the forest with very little stopping along the way and with much huffing and puffing we finally reach the summit. Normally from this rocky mountainside you can see for miles and miles and on a clear day catch a slight glimpse of New York City but not today. Today the mist is so thick, maybe we can see 200 feet beyond the cliff in the pure steam-filled skies as if the lake below is an overflowing boiling pot of water that blew its cover. Today, I cannot see the city but I do KNOW tall buildings are reaching for the sky this very moment. With amazing awe, I have experienced the breath-taking view from this vantage point on a number of occasions and I promise you NYC is still there. But I can not see it. How do I know it is actually there? Well…sometimes we can see things and some days we can not. On days you can not see it does not mean the facts have changed, as mentioned, we know the city still stands tall across the cloudy skies. It is still there. I relate this to love in some degree. We may not always see it but it is still there. Some days your loved ones may not actively display loving actions or thoughts but that does not mean the love is not there, maybe you simply can not see it today because of a recent storm and on others days your heart swells up bigger than a canyon in Arizona. That is how it is with God’s love. Some days His love manifests itself so powerfully, the joyful experience offers more peace in five minutes than one may get in three full days of peace, love, and music in Woodstock, NY. On others days maybe it can not be seen but it is still there. He promises us throughout the scriptures and He showed His love to the world via a sacrifice (to end all sacrifices) so we can experience His love. God’s love is always there. His written Word (The Bible) says seek me and you will find me and God is love. My take on that is seek God and you will find love. I know I did, Praise the Good Lord! For me, I would not want to take this journey any other way than finding true-love. A love that never ends and never fails and as I just noticed on my shirt in the enclosed picture, a love that lasts Forever and Forever is a long time. Amen!! Posted on July 8, 2016	by Timothy S.
Out for a walk in the crisp soft rain a small shiny piece of metal lies face up in the street. So what’s the big deal,there’s a dime on the ground? For me the big deal is I met this guy in San Francisco recently and he finds a dime on the ground every single day for the last 12 years. He is the epitome of a free spirit. He says he sold his company, sold his BMW, and sold his jet-ski and moved to Hawaii where he earns $50 a week creating some sort of green sustainable ecosystems. Sure enough as I speak these words, FDR’s Presidential head lies face up on the sidewalk. There it is. 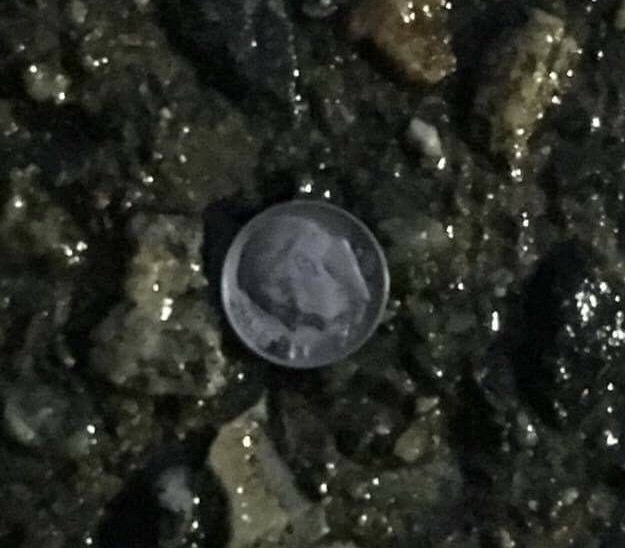 A dime laying in the street, (talk about timing). 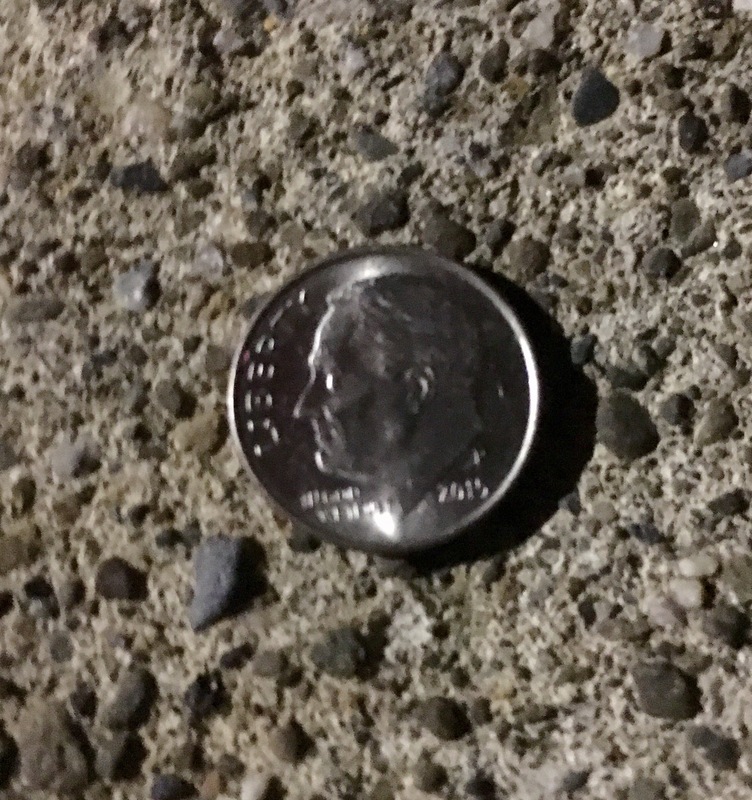 I find a dime here and there every once in a while, but tonight when I stumbled across a dime on a late night summer-stroll through the gentle misty rain it begs me to ask the question what does this mean? I still do not know the answer but I find it remarkable that I came across the dime as I was telling a friend the story about this guy I met in San Fran finding a dime everyday. Ocean finds spiritual significance in finding a ten cent piece, for me, I think it may symbolize God will always provide for me financially. What was I thinking when I found the dime?? Well, the fact is I was thinking about Ocean at that very moment and thinking about “writing” a story about him. I will take Ocean’s advice and try to find the spiritual meaning to all this..
Ha, I think it just hit me. When speaking to Ocean in California, he was convinced that I am to be a writer. Afterall, Ocean’s real name is Jeremiah and Jeremiah is an Old Testament prophet and my favorite verse comes from that book. What if I am to write and God is telling me to spend more time doing it and the rest will fall into place? That could be delightfully cool. Unlike Ocean, I don’t have a BMW to give up and I don’t have a jet-ski to sell and I’m not ready to plant plantations in Hawaii for $50.00 a week but I do know God provides for His children and from here on in every time I find a dime in the street I will be reminded of Ocean’s message. Angels deliver messages and Ocean conveyed a message to me, maybe Ocean is an angel. I don’t know for sure but until I do, In Harry Chapin style, I will stuff the bill (or in this case-a dime) in my shirt and I will pray for Ocean with every dime I find. Care to join me? When you find a dime, say a quick prayer for Ocean. He will be forever blessed. Posted on May 30, 2016	by Timothy S.
Standing in Church today the guest preacher asserts, “Our beauty takes God’s breath away.” I think to myself….Does it really? Do we really take His breath away?? I know God sees us as diamonds as I wrote in a recent journal entry and I believe He sees us as beautiful as I mention in my previous “Beautiful You” writing but breathtaking? How many people can take your breath away? I’ve seen a few but the amount is in the single digits. Right after the preacher proclaimed this bold statement, with my eyes closed, I ask God if that statement is true. My thoughts toward God were, I know you see me as a diamond but if what this guy (preacher) is saying is true let me see diamonds. I suppose I could have looked on the left hand on some of the engaged or married women nearby and seen a few representations of somebody’s love and commitment shining forth on their ring finger but I like to ask God for less obvious clues. Opening my eyes and looking towards the pulpit, I do not see anything. 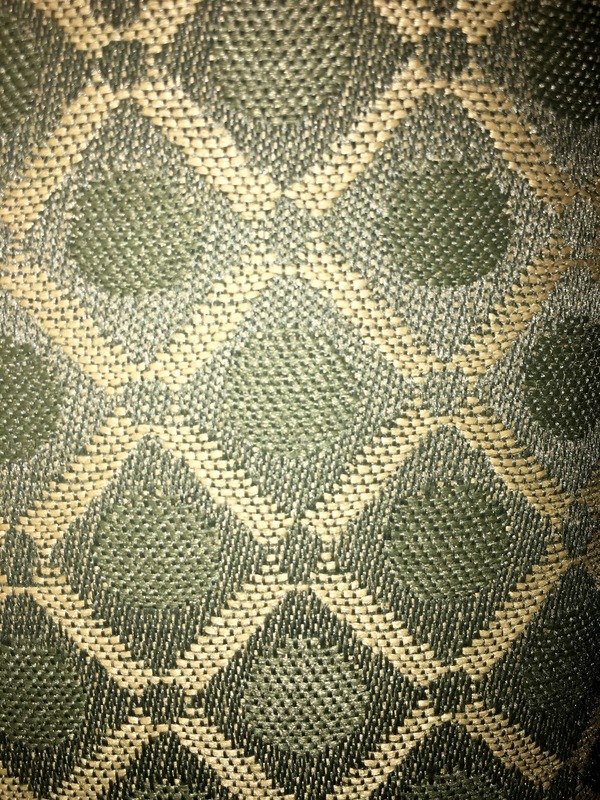 I glance down and nearly popping off the chair is a pattern made of diamonds. 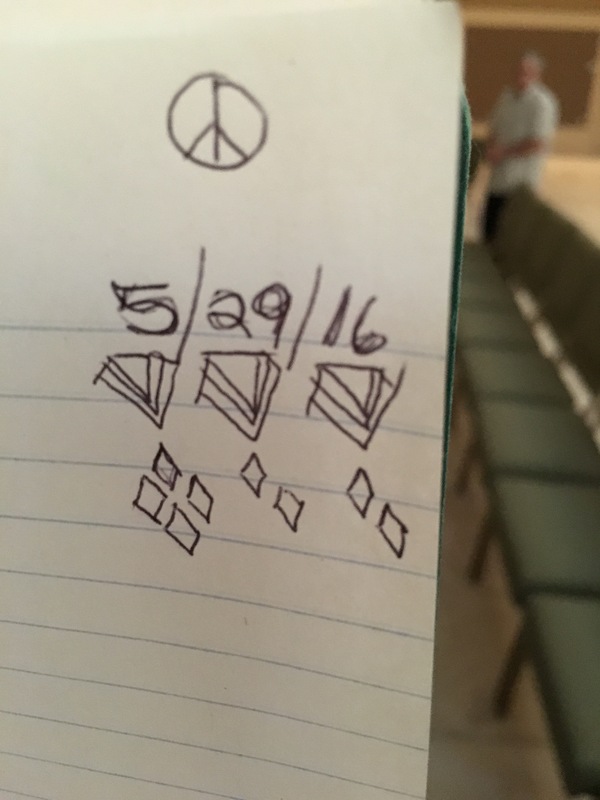 I have been going to the same church for three years and I never noticed the diamonds all around me. When God wants to show us something He will make sure the message is perfectly clear. As if the diamond fabric answer did not satisfy my soul as soon as the service is over, I turn around and say hello to the lady behind me and it just so happened that she is the woman that sang the words “Your love is like radiant diamonds” sparking my previous diamond story written last month. Taken back in delightful surprise, with a WOW, I ask if can I take a picture of the diamonds she doodled. I share this story with you because I want you to be encouraged and for you to know your true beauty, “breathtaking beauty.” You take God’s breath away! Apparently we do take God’s breath away. I do not know why I am surprised by this conclusion, after all He made us. Posted on May 24, 2016	by Timothy S.
I know of something even better than that. I call it “A Proverb a day.” Reading and applying just one Proverb a day gives you more wisdom than an ant working diligently everyday in the summer storing up its food for the winter. Imagine taking a shot of wisdom each and every day for free. I say shot because they are less than one page each yet chock-full of instant and powerful wisdom. The Book of Proverbs beams a total of thirty-one chapters. I like to see it as one for each day of the month. You can find time-tested winning words in the Old Testament of the Bible. The 31 chapters are loaded with God’s wisdom spoken through King Solomon who is arguably of course considered the wisest King of all time and certainly the wealthiest. It is no coincidence the Book of Proverbs contains 31 chapters. By ingesting one chapter a day, every day, you complete the whole Book of Proverbs each month 12 times a year. You are privileged to have access to such sage advice twelve times a year ensuring this available wisdom sinks into today’s mind that is more cluttered than the contents of a 3,000 square-foot home being stored in a 100 square foot storage shed. Clear your mind for a minute or two each morning and start your day with Godly instructions. You may gain a productive/rewarding, and healthy life when you apply the principles Proverbs suggest. The King’s Proverbs teach us about foolishness, wisdom, pride, fear, wealth, gossip, insecurity and a whole host of pertinent ideologies as well as today’s materialistic concerns. A Proverbial example is Proverbs 12:24 suggesting diligent hands will rule for laziness ends in forced labor. This Proverb is probably common sense but applying it is where wisdom comes in. God offers His wisdom freely if you ask Him for it. Sometimes wisdom is just common sense with ardent application. I encourage you to start today. Pull out your Bible to whatever day you are reading this writing and read the one-page Proverb of the day. If you are reading this article on the 24th day of the month, start with Proverbs Chapter 24. Wisdom is good for the soul and leads to a reward, a reward of hope and hope is a good thing. What’s your favorite Proverb? Do you have one.? Do tell. Posted on May 8, 2016	by Timothy S.
I spent a lot of mental energy recently pondering what great life event I should embrace as I turn 50 tomorrow. At best I get another 50 years here. I want to enter my 50’s with a full heart yet an open heart, full of vigor, drenched in wisdom, filled with love, gentleness, and kindness yet be a warrior when needed. Walking past an aluminum shiny pull-off soda can tab recently, I thought it would make a fun picture for I have a newly developed interest in photography. The tab although old, was in intact even though these were not used on beverage cans since I was a teenager in the early ‘80s. It sat on the ground in great condition probably being unearthed recently with all the spring rain. Broken in two pieces lies the tab in the wet street the next day. Oh well! So much for my fun picture of the unbroken ring. Today while winding down my 40’s and taking photos down at the local river, a shiny tab reflects through the clear streaming fresh waters. Of course it is another soda tab and it is not broken, lying peacefully in the river-bed all in one piece as posing for a photo. I took the picture. I got a SECOND CHANCE! I often hear a cliché people say…’God is a God of second chances.’ I do not know exactly what that means but I do hope to enjoy the sounds of waves crashing, birds chirping in the rain forest, raindrops falling as I walk hand in hand with the woman that walks with me into eternity and God pours His grace out on me. I am ready to hear her heart beat speed up as I pull her near. This is phase 2 of life for both of us and there are seas to be traveled, rivers to be walked, oceans to be swum in and skies to rocket across. I hope to see as many shooting stars as I have over the last few years. Some of the best and most important things happened to me in Stage 1 of life and I am forever grateful and thankful for those of you that were/are a part of that and I pray for those continued blessings into Stage 2. More peace, love, and understanding are coming my way. It will be more than just an Elvis Costello song. Being well grounded in my faith, I trust a new maturity is unfolding for me. As I mature, I hope to stay forever young. I hope my spirit remains youthful and I never stop laughing. I want my heart to always radiate joy and my baby-face never to lose a smile. I will continue dancing even though I can look like a lanky fool sometimes. Who cares? Life is to be lived. No one is watching anyway. I am ready to rock. I enter my 50’s with great optimism. As a 50 year old friend whom I have known since High-School tells me, “50 is a very strong solid age.” I like that. It sounds grown-up. Other friends say age is just a number. As I say goodbye to my 40’s, 50 is a number I am ready for. Come on 50. I am ready for you. I welcome my old friends to come with me and I look forward to all the new people I will meet. Are you with me? Posted on April 30, 2016	by Timothy S.
Patience, we all need it. When in need God always delivers when we ask Him. I needed to be reminded today about waiting. Facebook has that new feature offering to post a memory of a previous post. Today’s memory is a brief story I wrote about patience as sung by the one and only Bono. See story Story on Patience…. Once I post a story I tend to not reread unless someone brings it to my attention. 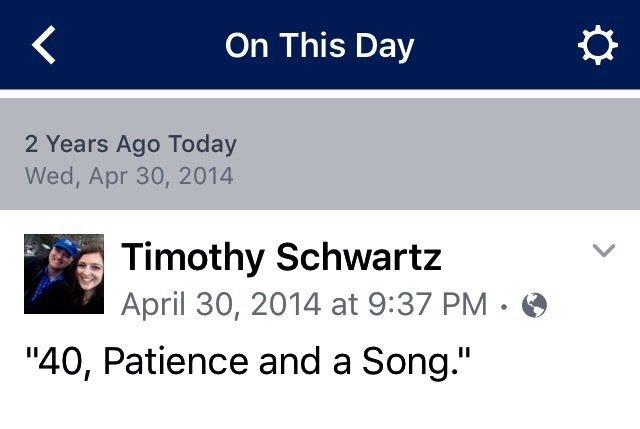 My post about patience 2 years ago is right on with today’s need. I would not change a single word. 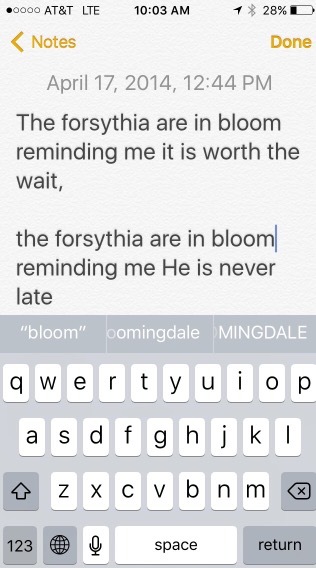 Furthermore as I went to write what I am writing now, a poem came up on my screen that pertains to waiting, this also was written two years ago. the forsythia are in bloom reminding me He is never late. So the point of my story is God reaches us and delivers our every need when we reach out in prayer. He is always talking. Listening is key. Thanks for the prayer and thanks for reading. Posted on April 18, 2016	by Timothy S.
What do you want? What do you really want? Do you really want it? I mean not like you have to have it and if you don’t get it you feel like a fish without gills, but you really want and desire it. Is your soul guiding you to want it? Are you afraid to want it because you may not get it? Let’s face it, no one likes disappointment. What if God wants you to have it too? Do you we really know what God wants us to have? Doesn’t He give us certain desires? Yes, I believe He does. The key is to line those desires (wants) up with God’s will for your life. If the want and His will diametrically oppose each other, they self-destruct and then you will not want it anymore anyway. If your deepest want is your biggest dream, bring the power of God to make it come true. In fact, it is true already. You just have to live as if it happened while exercising the wisdom the good Lord endowed upon us. Make sure your wants line up with His desires for His children. Commit to it if you know it is right and it creates mutual blessing and watch it unfold in His timing. It says in the book of wisdom (Proverbs) the desire of the righteous will be granted, Proverbs 10:24. Ask God if it is not His will for you to have such a desire or want, ask Him to remove it from your heart and have it wash away faster than a smashed bag of crackers washes away when opened and tossed into the surf. If it is good you will have it. If you do not get it you’ll be shown why it would not have been good for you. Don’t be shy, don’t be afraid. Be bold. Ask for it. Get ready for it. Embrace it, bury fear. Allow faith to make it happen. Be patient. If it is worth having, it is worth waiting for.